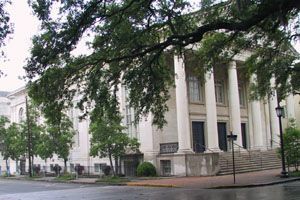 Today the Southern Baptist Convention convenes in Savannah, Georgia at the city’s First Baptist Church (pictured). Attendance is down due to the war. Yet much of what takes place follows the same pattern of previous assemblages, since the founding of the SBC in 1845: committees are appointed, reports are read, and a convention president is elected – in this case, Richard Fuller, pastor of Seventh Baptist Church in Baltimore, Maryland, who is re-elected. The real story, however, is much bigger than the standard routine of committee formation and reports. By now, Baptists in the South, numbering about two million persons and of which Southern Baptists comprise the majority, rival Methodists for dominance in the region. Founded in defense of the institution of African slavery, many Southern Baptist leaders are already on record as supportive of the Confederacy, offering their public approval and appropriating God’s blessing for the southern cause. In today’s conversations are references to the war, whether in hallway chatter, sanctuary dialog, or outdoor musings. Excitement attends discussions of the great conflict now consuming the American nations. Recognizing the obvious, the SBC in session votes to form a committee “on the state of the country.” Within a few days, upon the recommendation of the committee, the SBC will issue its own official proclamations of support for the southern Confederacy, formally embarking the SBC on a journey into southern Christian Nationalism.